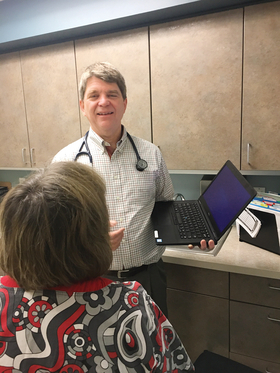 Dr. John Cullen's four-physician family medicine practice in Valdez, Alaska, employs three full-time staffers who work on insurance and patient billing. A fourth full-timer focuses on obtaining prior authorizations from nine private and public insurers. Even then, Cullen and his partners often must call and write letters to convince insurers to approve coverage or pay claims. "It's an incredible bureaucratic mess to get anything done for patients," said Cullen, president-elect of the American Academy of Family Physicians. 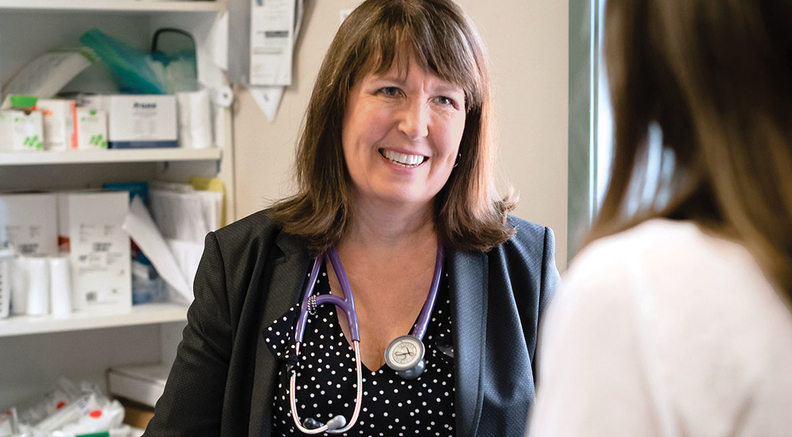 In contrast, Dr. Trina Larsen Soles' 12-physician general practice in Golden, British Columbia, has one full-time staffer assigned each day to billing the province's public medical services plan, its public workers' compensation plan and its quasi-public auto insurance company. She and her colleagues don't get involved in billing or utilization-review issues. "It's not a big hassle," said Larsen Soles, president of Doctors of BC, which represents British Columbia physicians in fee negotiations with the provincial health plan. "I can focus on patient issues, not administrative issues." The sharp difference between the two doctors' experience partly explains why the U.S. healthcare system has much higher administrative costs than Canada and other countries. Those costs, plus much higher prices for medical services and pharmaceuticals and much higher pay for physicians and nurses, were the major reasons the U.S. spent a larger share of GDP on healthcare in 2016 than 10 other wealthy nations, according to a recent study in JAMA. The authors said the huge spending gap—17.8% of GDP in the U.S. versus an average of 10.8% in the other 10 countries—was not primarily driven by the factors that often get the blame. Those commonly cited culprits include excessive utilization caused by the U.S. fee-for-service payment system, defensive medicine prompted by liability worries, underinvestment in social programs, and a low mix of primary care to specialty care. The JAMA study findings reinforce doubts about whether the current U.S. policy mantra of shifting from fee-for-service to value-based payment, plus adopting high-deductible health plans to squeeze out unnecessary care will be the silver bullet to reduce spending. Instead, the authors suggest the need for measures aimed directly at bringing down the prices of drugs and medical services. "We do have some overutilization, and value-based programs can help," said Dr. Ashish Jha, a professor of global health at Harvard and a co-author of the article, which was based on data from the Organisation for Economic Co-operation and Development. "We completely have a price problem. MRIs cost twice as much in Kansas as in London, and that makes no sense." "We don't want to tackle the issue of prices so we defer the discussion to things we think we can deal with, like the differences in quantity," added Gerard Anderson, a health policy professor at Johns Hopkins University who has studied international systems. Eight percent of U.S. healthcare spending went to administrative costs incurred by private and public insurers, compared with an average of 3% in the 10 other wealthy countries, the JAMA authors found. That 8% figure doesn't include billing and insurance-related activities by hospitals and physician offices. Including those costs would bring the share of U.S. healthcare spending on administrative costs up to about 14%, according to Dr. Steffie Woolhandler, a health policy professor at Hunter College. A 2013 Health Affairs study co-authored by Woolhandler found that administrative costs accounted for 25.3% of U.S. hospital spending in 2010, compared with 19.8% in the Netherlands, 15.5% in England, and 12.4% in Canada. For example, Minnesota-based HealthPartners employs about 200 full-time staff to handle back-end billing and collection work for its one hospital and 36 clinics and specialty locations, a HealthPartners spokesman said. In contrast, the University Health Network in Toronto, which has six hospitals including Toronto General and 1,272 beds, has just 5.5 full-time-equivalent employees handling insurance billing and patient collection activities, a UHN spokeswoman said. Meanwhile, its CEO was one of the highest-paid hospital managers in the province of Ontario with a 2017 salary of $558,000 (C$720,000) at recent currency rates, according to the Canadian Broadcasting Corp. The median base salary of a stand-alone hospital CEO in the U.S. in 2017 was $550,000 and with bonuses and incentives that rises to $648,000, according to Modern Healthcare's Executive Compensation Survey. It's the same story for doctors. Physician practices in Ontario spent just 27% as much per physician per year on interactions with insurers as U.S. physician practices spent, according to a study published in Health Affairs in 2011. Those administrative cost disparities arise from starkly different payment systems. While the U.S. has hundreds of private and public payers that each set their own rates with providers and drugmakers, the other 10 countries either have a single public health plan or have private insurers that pay the same nationally negotiated prices. "We have a much more complicated healthcare system than anyone else, so it's no surprise that the cost of administering it is so much higher than in any other place," Jha said. Some experts disagree about the rationales and remedies for this country's higher administrative costs and prices. Simply comparing total healthcare spending in the U.S. versus other countries may be misleading because the quality and intensity of services here may be higher, said Katherine Baicker, dean of the University of Chicago Harris School of Public Policy, who wrote an editorial accompanying the JAMA article. What really matters, she argues, is the value of each additional dollar spent. "It's really important to figure out whether we're consuming the same healthcare as other countries and just paying more, or consuming more intensive versions than other countries," Baicker said. On quality and outcomes, however, the JAMA study found a mixed picture for the U.S. compared with other countries. The U.S. ranked low on population health outcomes such as life expectancy and maternal and infant mortality, while rating well on mortality rates on heart attack and stroke outcomes. Contrary to widespread belief, the study found that U.S. medical utilization rates are not that different overall from rates in other advanced countries with much lower total spending. 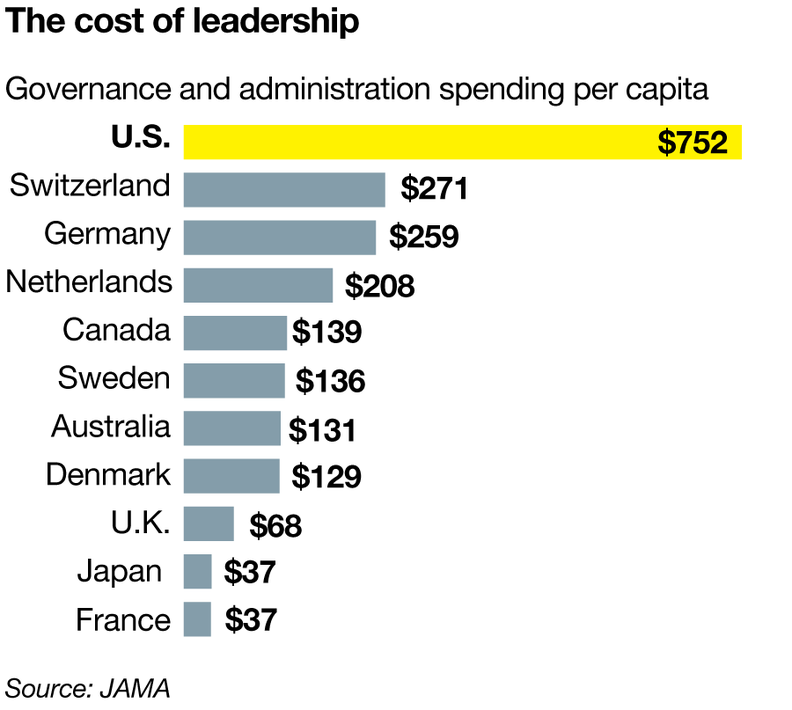 The U.S. was in the middle of the pack on hospitalization rates for heart attacks, chronic obstructive pulmonary disease and pneumonia, with a lower percentage of total spending on inpatient and long-term care than most of the other countries. It was on prices where the U.S. was the clear outlier. Driven by sharply higher prices for brand-name drugs, the U.S.' per-capita pharmaceutical spending was more than twice as high as average spending in the other 10 countries—$1,443 versus $680, the study found. Prices for procedures and services also were much higher in the U.S. The International Federation of Health Plans reported in 2015 that coronary artery bypass graft surgery cost $78,318 on average in the U.S., compared with $34,224 in Switzerland and $14,579 in Spain. Abdominal CT scans cost an average of $844 in the U.S., compared with $483 in New Zealand, $233 in South Africa, and $85 in Spain. Average payment for an MRI was $1,119 in the U.S., $455 in South Africa, and $215 in Australia. "We just charge so much more for everything," said Elisabeth Rosenthal, editor-in-chief of Kaiser Health News and author of a new book on the factors driving up U.S. healthcare costs. "We don't negotiate on a large scale like other countries." The U.S. also pays physicians and nurses significantly more than other wealthy countries do, which further hikes prices and spending, according to the JAMA study. The average pay for specialist physicians in the U.S. was $316,000 in 2016, compared with an average of $182,657 for all 11 of the countries surveyed. Generalist physicians in the U.S. earned $218,173, compared with an average of $133,723 in all 11 countries. U.S. nurses earned $74,160 on average, compared with $51,795 in all 11 countries. Healthcare industry executives in the U.S. also make far more on average than their counterparts in other countries. Experts say that because of greater income disparities in the U.S. than in other countries, healthcare professionals here expect to be paid more to keep up with their counterparts in other industries. "If you pay less, there will be fewer doctors," Baicker cautioned. Some analysts say the mandate to maximize revenue is an inseparable part of a U.S. system that is more profit-oriented than systems in other countries. "It's the ideological model," said Aaron Katz, a lecturer in global health at the University of Washington who has studied the U.S. and Canadian systems. "The system is perfectly designed to provide opportunities for organizations to make money." At the urging of business consultants, U.S. providers have boosted revenue by breaking out separate fees for every service item, such as OR recovery room time, in contrast to much simpler billing in other countries, Rosenthal said. At the same time, U.S. patients have come to expect fancy, hotel-like facilities and amenities, far different from the utilitarian facilities abroad. Even so, she and others say identifying villains is not productive. "How did we get to this crazy place nobody likes?" Rosenthal said. "Everyone wants to name a bad guyâinsurers, drugmakers, high salaries. But it's kind of all of the above." Nevertheless, many experts agree with the JAMA study's conclusion that high prices and administrative costs, more than overutilization, are to blame for this country's singularly high healthcare spending. That won't change until the people who pay the bills start using their clout to push down prices, Johns Hopkins' Anderson said. Indeed, it may be starting to happen with the January announcement that three corporate powerhouses, Amazon, Berkshire Hathaway, and JPMorgan Chase, are teaming up to tackle healthcare costs. "When American corporations say we are no longer willing to pay 50% more than Medicare for the same service, we'll have a discussion about healthcare spending," he said. "Until then, we'll be talking around the edges." Jha's preferred solutions are for Medicare to take the lead in trimming provider payments for certain overpriced specialist services, and for the government to more aggressively enforce antitrust laws to prevent providers from consolidating to raise prices. The University of Washington's Katz, who sees no evidence that market competition works in healthcare, wants to see the government set overall spending levels and payments to providers and drugmakers, as other advanced countries do. "But that would impair everyone's revenue and profit growth, and the U.S. players don't want to hear that story," he said. Any spending reduction effort would have to lighten the crushing administrative burden associated with the numerous U.S. payers each setting their own payment rates and coverage policies. Cullen, the family physician in Alaska, said he tried to persuade a Canadian doctor who works a few months a year at his office to join his practice full-time. She turned him down flat due to the hassles she's experienced in dealing with U.S. insurers. "She's just horrified with what we do here," Cullen said with a laugh. "This is a crazy system."